They had lain undiscovered for centuries in a city park, hiding a life long since forgotten. 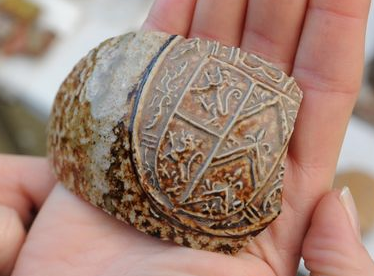 But now a series of artefacts discovered in Cardiff’s Bute Park this summer – thought to date from the 16th and 17th century – may have revealed a window into the lives of aristocrats that once lived there. Archaeologists had discovered the important treasures while excavating Mill Leat – a historical water body located on the outer western edge of Cardiff Castle which has been drained since the 1970s. The excavation, part of the Bute Park Restoration Project, took place over six to eight weeks from July and stumbled across finds including animal bones, engraved leather, a sword sheath, imported Venetian glass, a pewter spoon and clay tobacco pipe fragments. Material found was a mixture of upper class items thought to belong to former aristocratic residents of Cardiff Castle and pieces reflecting working class life – all thought to have been discarded and washed away. Thanks to a maker’s mark on one of the tobacco pipes discovered, the finds have been dated back to the 16th and 17th century, when the wealthy Herbert family would have been living at Cardiff Castle. Julia Sas, project manager of the Bute Park Restoration Project, said: “In among the bones, there’s red deer – venison – and a very high status meat. “There’s evidence these very high status bits come from a family at the castle. As well as that, there’s working class industrial finds coming from outside the other side of the water. You are getting a snapshot of two different classes of the time. Bute Park is undergoing a £5.6m restoration as part of the project, supported by a £3.1m grant from the Heritage Lottery Fund (HLF). It is seeing important historic features restored to help tell the story of the park. The reintroduction of water to the old castle moat running alongside the original 12th century mill stream is one of the key tasks being undertaken.Amelia Pannett, project manager for Archaeology Wales, said: “As part of the HLF funded restoration project, one of the main objectives was to refill it, so to do that we had to excavate it to put a liner in so, when we do fill it, water won’t wash away. “It was just where we excavated. No-one expected to find this type of collection. “When we took the silt down, there was a line of wooden posts and timbers in the top of the silt, at which point we thought ‘oh’. We were surprised definitely. In total more than 3,000 individual pieces have been recovered. The artefacts were sifted through and washed over the course of yesterday and Thursday with the help of volunteers among the student body in the archaeology department at Cardiff University. And ornate imported copper- glazed cups and cooking pottery were among the items being pieced together yesterday. Meanwhile fragments of bellarmine jars imported from Germany showed a court scene on one and a coat of arms on another. 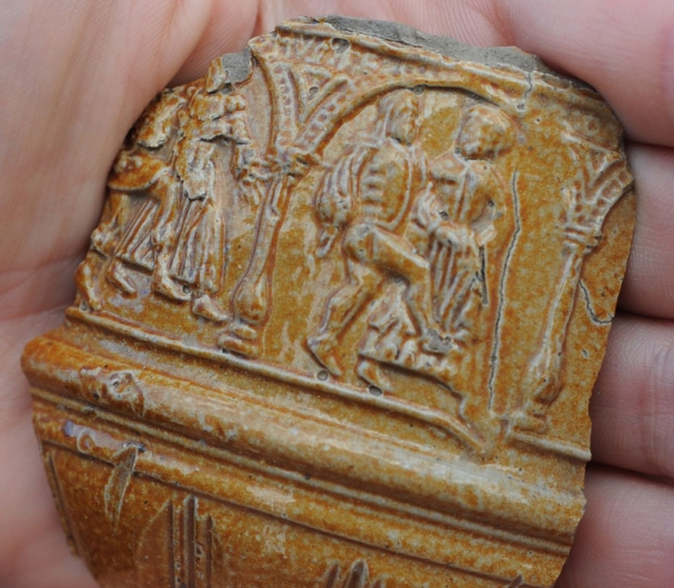 The pieces will require further, more detailed analysis to explore their significance, but the early signs are they shed new light on a period in the history of the capital city. It is hoped many of the pieces will end up at the National Museum Wales in Cathays Park or the Cardiff Story Museum on Trinity Street, or both.